Great - let me know if you run into any problems trying the game. I'm out trying to resource additional spectral data for the game! 1) I tried it for C-NMR. You can simply count the peaks, and compare to the number of carbons in the structure, right? 2) You can get the same structure more than once in the candidate list. 3) This game doesn't have a learning curve so much as a learning cliff. 1) Only use structures with the same number of atoms. 3) A tutorial? Some kind of limited peak picking/selection interaction with the molecules? If you need software, I am a CDK developer, and would be happy to give help, if you wanted it. Did you see the foldit game? That was a large development effort, so it's not a fair comparison at all. However, what is interesting about it is the number of non-expert users who were drawn in. There is a link to a YouTube tutorial on the front page of the web version of the game. If you're asking about a tutorial on how to interpret spectra I don't think there are any shortcuts. 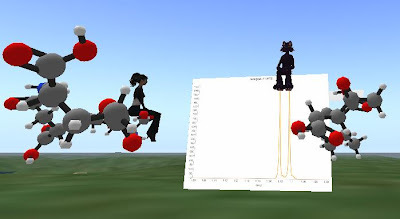 This is intended for students who are learning or have learned NMR in their classes. Yes the C NMR can be figured out easily if the structures have different numbers of carbons. We could probably do something about that. If you find any duplicates or problems with the spectra please use the link in the game to flag and make a comment. You should not be getting duplicates. Thanks for offering to help with your CDK experience! If there is a component that you would like to build lets definitely discuss. Ah, yes actually I did watch the youtube tutorial. That is good. However, I mean that it would be possible to teach students spectroscopy through the game - levels of difficulty, for example by increasing the number of candidates. To be clear, I meant duplicates of the molecules, not duplicate spectra. I could imagine that an integrated spectrum/molecule applet could allow the player to assign peaks to aid the identification of the correct candidate. Some updates re data: Another 30 H1 spectra provided today from my alma mater. These are drug like compounds. 1) Can the NMRShiftDB be exported in JCAMP format as synthetic spectra so that we can load onto ChemSPider and view in JSpecView OR should we just deliver them as "synthetic spectra" through the NMRShiftDB applet? 3) For C13 our webservice can be used to find structures with the same number of carbon atoms. Also, eventually, to find "similar structures"
I would love to try this, but currently the spectrum only shows an image of a cat, and will not allow itself to be reset. Are you still supporting this? Can you look into the issue?